as colmin8r points out, the script from lesson 32 has no user interface, so you can’t control how files are named. that’s what this lesson is all about — extending the script to give you more options. this is how scripts develop — get the basic functionality working, then expand the script to make it more user-friendly, or adaptable, or whatever. a couple of things to notice … we’ve also added the option of breaking the filename at the first full stop which, if you’re naming your files correctly, means not shortening the filename at all. the dialog also shows the existing filename (in this case “export separate pages_test_file.indd”) to make it easier for the user to make their selections. set mgDelimiter to " "
two things to note here. we’ve added some error handling just in case the user inadvertently leaves “(can be blank)” in the text field of the user interface — we don’t want that to become part of the filename, so we change it to “” (that is, nothing) instead. also, we’re using an underscore to join the shortened filename and the suffix. hopefully it’s pretty clear how this filenaming works. 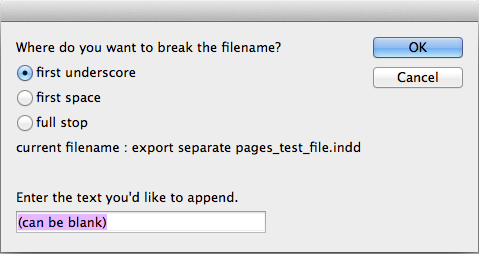 as an example — if we start with the filename “export separate pages_test_file.indd”, break it at the first space and add the suffix “concepts”, our resulting PDF filenames will be “export_concepts1.pdf”, “export_concepts2.pdf”, etc. display dialog "come on dude — that's not possible" & return & "there are not " & mgPlace & " \"" & mgDelimiter & "\" in the filename" & return & return & "have another go" buttons "sorry"
so this time — if we start with the filename “export separate pages_test_file.indd”, break it at the second space and add the suffix “concepts”, our resulting PDF filenames will be “export separate concepts1.pdf”, “export separate concepts2.pdf”, etc. and, of course, you can keep on expanding the script until you have as many different options as suits your needs. the next lesson will look at a couple of other ways we could approach the naming of these separate page PDFs — automatically generating filenames based on data already existing in the document. This entry was posted in applescript, indesign, scripting lesson and tagged adobe, applescript, automation, dialog, export individual pages, export separate pdfs, how to, InDesign, tutorial, user interface by macgrunt. Bookmark the permalink.